One kind of lifting and transporting accessory is the tie down. 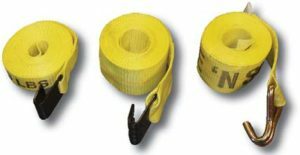 These fasteners are used to hold items in place during transport and are made from high strength webbing, designed to be attached to strong, durable tie down hardware. The high strength fabric that is woven into web slings makes them lightweight but strong. Chains can also be used to tie down cargo. Chains are rated according to number grades. Each grade is designed for specific use. Both chain and high strength web tie downs are made with the fastening of goods with truck, trailer, pallets, boxes, containers, etc. in mind. Please see the Tie Down section of our catalog, below for more information. 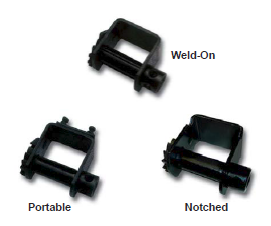 Tuffy® Products offers a wide selection of web slings and tie downs. All products bearing the Tuffy® Products name are guaranteed to be high quality. 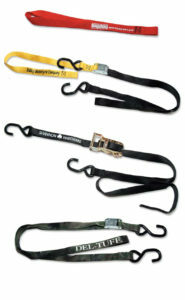 Tuffy® Products Tie Downs meet or exceed the leading standards. Tuffy® Product's offers both import and made in the USA products in our Tie Down line. To purchase, or find more information, please email for a quick quote. Winch bars available in chrome or painted styles. Secure Cargo with a Personalized Touch: With custom imprinted tie downs, you can keep your image and services always in front of your customers, even after the sale. If you are interested in getting a step up on your competition, give us a call and let us create an impression that will last for years.